Benedict Saul McCarthy known as Benni McCarthy is a former South African footballer and was born on the 12th of November 1977 to Dudley and Dora McCarthy. He is currently the head coach of Cape Town City FC, a South African football club that plays in the PSL. McCarthy started his footballing career at a local side called Young Pirates, which was then managed by his uncles. He later joined the youth structures of a local amateur club called Crusaders. He was signed by first division club Seven Stars at age 17. McCarthy is still the all-time top scorer of the South Africa national team with 31 goals. 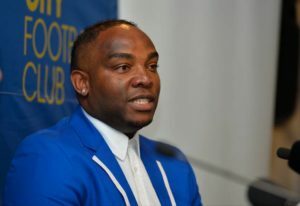 Benni McCarthy was born on the 12th of November 1977 to Dudley and Dora McCarthy and is currently 41 years old as of 2018. He was born in Cape Town, South Africa. Benni McCarthy started his playing career for Seven Stars scoring a total of 13 goals which earned him a transfer to Cape Town Spurs. After some few years in the PSL, he was sold to Ajax football club in the Eredivisie where he scored 9 goals and won his first major trophy in Europe. He was then sold to Spanish club Celta Vigo for 6 million euros making him the most expensive South African player at that time. While at Celta Vigo, he performed poorly which led to him being loaned out to Portuguese giants F.C Porto. At Porto, he won the golden boot after scoring a staggering 20 goals in 23 games. He also guided them to win the UEFA Champions league in the 2003-2004 season under Jose Mourinho. McCarthy got married to Maria Santos from Spain in the year 2004. Together, they have three daughters; Minna, Mya, and Allegra. Unfortunately, in 2007, they got separated and McCarthy got married to Scottish model Stacey Munro in May 2014 Together, they have one daughter, Lima Rose.